Prior to your visit to Eccles Clinic, take time to familiarise yourself with some of our requirements and practices as detailed below. Smoking cigarettes increases the risk of poor healing or infection, causes increased coughing and bleeding after surgery and other complications. As a result we strongly recommend smokers stop smoking for at least two weeks before minor surgery and six weeks before major surgery. Take all routine medicines but certain medicines require attention. If in doubt always check with your surgeon well in advance. Many vitamins cause increased risk of bleeding and bruising. If you are taking any of the following be sure to stop a week prior to surgery: vitamin E, echinacea, garlic, ginger, ginseng, arnica gingko biloba, and St. Johns Wort. You may take vitamin C (no more than one gram per day), as well as vitamins B, K, iron and zinc. Do not take combination products containing unknown ingredients (e.g. "chinese herbs"). To ensure the minimum amount of discomfort during your procedure, there are different types of anaesthetics your Surgeon may use. This is a full anaesthetic, carried out in hospital under the care of a fully qualified anaesthetist. While under general anaesthetic your procedure is carried out without discomfort or knowledge to you that the operation is taking place. Operations carried out under general anaesthetic may be done as a day case or as an overnight stay in hospital however, patients must be accompanied when leaving the hospital. A sedating drug is administered to you by a qualified anaesthetist in order that you sleep throughout the operation. The surgeon will also use a local anaesthetic at the operation site to ensure the area is numb and that you are not disturbed during surgery. Most operations carried out under sedation enable you to return home the same day of treatment. However, all patients who have received sedation must be accompanied when leaving the hospital. The surgeon injects a numbing solution to the area that is being treated to minimise any discomfort you may feel during the operation. You will be fully awake during the procedure and able to be immediately discharged on completion of your treatment. You do not need to be accompanied when leaving the clinic. Q: What is local anaesthesia? A: Local anaesthesia blocks the way nerves carry pain signals to your brain, and stops you from feeling pain without putting you to sleep. The simplest and best form of local anaesthesia is to inject the drug just around the area where the operation is going to take place. Another form is known as a regional block which can numb all the nerves to a finger, hand, arm, toe or leg being operated on. Depending on the drug used, the numbing effect can last from about two to eight hours. Q: Will local anaesthetic hurt? A: Most local and regional anaesthetic techniques involve using a syringe and needle to inject drugs in the correct place. Unfortunately, this can often be uncomfortable, and the local anaesthetic may sting during injection. Most patients consider this discomfort a small price to pay for pain relief during and after surgery. Q: How is local anaesthetic given? The treated area will very quickly start to lose feeling. Your operation will not start until your doctor is absolutely sure that the area is numb. It is important to realise that local anaesthesia takes away feelings of pain, but you may still feel pressure and movement during your operation. Q: What are the benefits to having local anaesthesia? A: Local anaesthesia is a commonly performed and generally safe procedure. In many cases there are clear advantages over general anaesthesia, such as speed of recovery and lower risk of complications. However, in order to make an informed decision and give your consent, you need to be aware of the possible side-effects and the risk of complications. 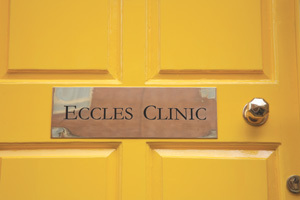 Your consultant at Eccles Clinic will be able to advise you on the options best suited to your procedure. A: Laser hair removal can be applied to all areas of the body and on all types of skin, even tanned or dark skin. The thickness and colour of your skin, and the colour of the hair to be removed, will determine which lasers can be used and how successful the treatment may be. Laser therapy for laser hair removal works best for people with dark hair. A: Lasers have been used in medicine for over 30 years. The clinical staff at Eccles Clinic are trained to the highest standard and regularly update their clinical knowledge and skills. A: Depending on the area of the body to be treated, the procedure may take anywhere from several minutes to one hour. In most cases, no anaesthesia is necessary. During treatment a focused laser beam passes through the skin and is absorbed by the pigment in the hair follicle. A percentage of those follicles are instantaneously and permanently disabled with each treatment. A: Patients typically see results in four to six treatments, though this will vary based upon skin tone, hair colour and other factors. Your consultant will talk to you about variables that may affect your individual results. A: As the hair shaft is the treatment target, it is important to stop all waxing, sugaring or plucking, or using hair minimising creams/deodorants for approximately eight weeks prior to your laser treatment. Removing the hair shafts prior to treatment means there will be no target for the laser. A: Traditional methods of hair removal only remove the part of a hair shaft that grows above skin. For complete removal of hair, laser treatment is best. Despite urban legends, shaving does not make hair grow back in faster, darker or thicker! A: An abnormal presentation of blood vessels, vascular lesions may appear as light or dark red marks or bumps. Vascular lesions can be congenital eg a port wine stain however they are mainly acquired through trauma for example sun burn or with an underlying medical condition stainimilar to large moles or varicose veins. Typical vascular lesions include scars, rosacea, thread veins and port wine stains. A: A pigmented lesion is a tan, blue-grey or brown skin mark that is caused by a deposit of pigmented cells at various depths under the skin surface. In removing these marks, several treatments are usually necessary for successful elimination. Typical pigmented lesions include sun spots and birth marks. A: Typically only one or two treatments are required and results can be seen in three to four weeks. Treatment time usually varies between 10 and 20 minutes, depending on the size of the area treated.